Brand New Valby Model CH140 Heavy Duty Skidsteer Mounted Hydraulic Roller Feeding Wood Chipper. 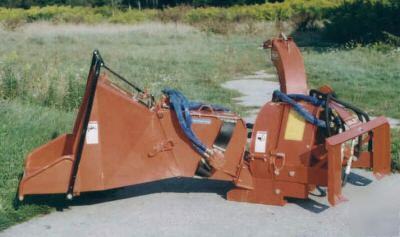 * This Woodchipper comes with the New Universal Skidsteer Quick Attach. * Feed Roll has 3 position controls; "Forward-Stop-Reverse". * Chips up to 6"-1/4" diameter material! * Comes with a 1 year warranty. * Hydraulic Requirments; Minimum of 22 GPM Hydraulic Flow @2500 PSI or a Minimum of 25 GPM of Hydraulic Flow @2000PSI. * Rated for Hydraulic Systems with a Maximum of 30 GPM Hydraulic Flow @ a Maximum of 3000PSI. * Chipping Capacity - 6"-1/4". * Flywheel Size (Diameter) - 26-3/8"